116 Commonwealth is located on the south side of Commonwealth, between Clarendon and Dartmouth, with 114 Commonwealth to the east and 118 Commonwealth to the west. 116 Commonwealth was built ca. 1873 as the home of Henry Lefrelet Daggett, a leather and shoe merchant, and his wife, Sara Eliza (Williams) Daggett. They previously had lived at 45 West Newton. Henry Daggett purchased the land for 116 Commonwealth on April 25, 1872, from attorney George Morgan Browne. He had purchased the land on September 29, 1863, from the Commonwealth of Massachusetts. Click here for an index to the deeds for 116 Marlborough. In July of 1879, Henry Daggett purchased the lot immediately to the east and arranged for 114 Commonwealth to be built on that lot by William S. Rand, a building contractor. When the house was completed, he sold the land to Rand, who then resold the land and house to attorney David Hill Coolidge. 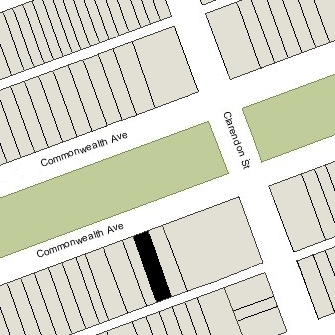 As a part of the transaction, 0.18 feet were added to the frontage of 116 Commonwealth (making it 28.18 feet on Commonwealth and 28 feet on the alley) and subtracted from the frontage of 114 Commonwealth (making it 27.32 feet on Commonwealth and 27.5 feet on the alley). This appears to have been an expedient way to correct an error in the placement of the party wall between the two properties. The Daggetts’ three surviving children lived with them: Henry Lefrelet Daggett, Jr., Sara Whittemore Daggett, and Eleanor Williams Daggett. Henry Daggett, Jr, married in October of 1873 to Evelyn Willard Fay. After their marriage, they moved to 353 Marlborough. He was a leather dealer and later a wholesale dealer in rubber shoes and boots. Henry Daggett, Sr., died in March of 1882. Sara Eliza Daggett continued to live at 116 Commonwealth with their daughters, Sara and Eleanor. Henry and Evelyn (Fay) Daggett, also moved to 116 Commonwealth to live with her. During the 1886-1887 winter season, the Daggetts were living elsewhere and 116 Commonwealth was the home of Henry Mason and his wife, Helen (Palmer) Mason. They previously had lived in Brookline. Henry Mason was a founder and partner in Mason & Hamlin, manufacturers of organs and pianos. By the 1887-1888 season they had moved to 39 Commonwealth and the Daggetts had resumed living at 116 Commonwealth. In about 1889, Henry and Evelyn Daggett moved to the Hotel Vendôme. Sara Eliza Daggett continued to live at 116 Commonwealth with her daughters until her death in March of 1900. In her will, she left the house to Sara and Eleanor. 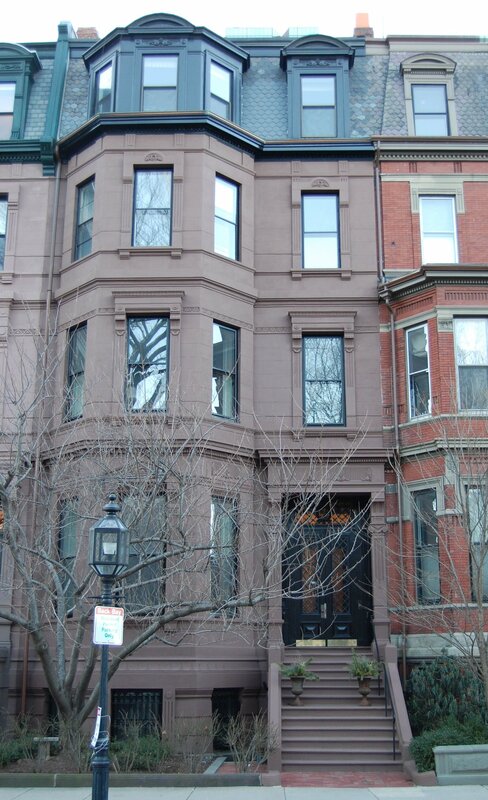 Sara and Eleanor Daggett continued to live at 116 Commonwealth during the 1900-1901 winter season, but moved thereafter to The Cambridge at 483 Beacon. By the 1902-1903 season, Eleanor Daggett had moved to the Hotel Royal at 295 Beacon. Sara Daggett traveled abroad and the 1903-1904 season was living the Hotel Somerset. In June of 1904, she married Dr. Robert Fowler Beattie. After their marriage, they lived in Brookline, where he maintained his medical practice. They also had a home on Phillips Beach in Swampscott, where Dr. Beattie drowned while swimming in August of 1905. Sara and Eleanor Daggett continued to own 116 Commonwealth and lease it to others. 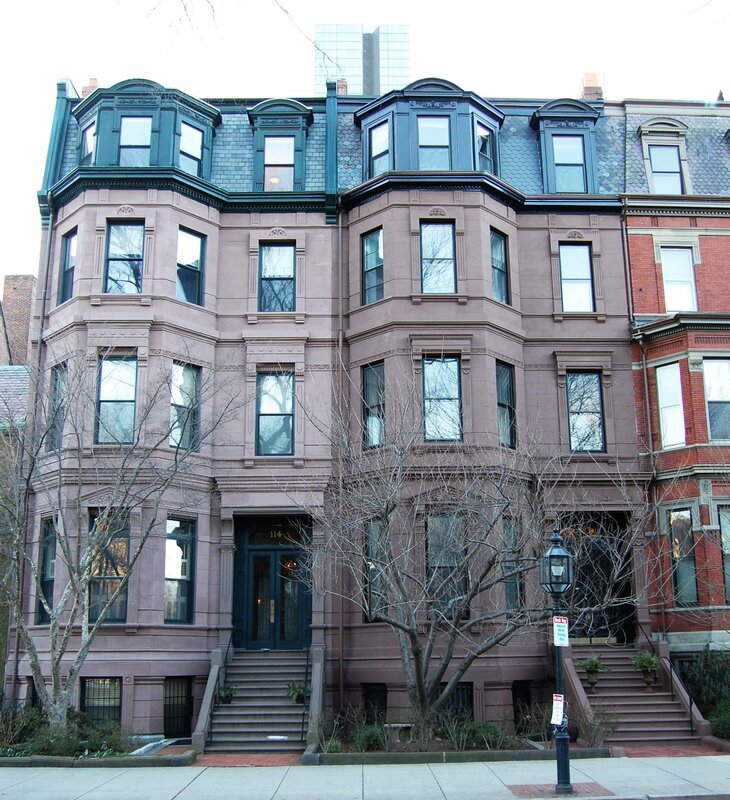 By the 1901-1902 winter season, 116 Commonwealth was the home of John Henry Brooks and his wife, Lucretia (Gilbert) Brooks. They previously had lived in Milton. They also maintained a home in Cohasset. John Brooks’s father, John Wood Brooks, was founder and president of the Michigan Central Railroad. The Brookses continued to live at 116 Commonwealth during the 1903-1904 season, but had moved back to Milton by 1905. 116 Commonwealth was not listed in the 1905 Blue Book. On October 4, 1905, 116 Commonwealth was purchased from Sara (Daggett) Beattie and Eleanor Daggett by Margaret (Chapin) Bazeley, the wife of William Alliston Ley Bazeley. They previously had lived at 306 Beacon. William Bazeley was a real estate investor. He served as a member of the State House of Representatives from 1909 to 1912 and of the State Senate from 1912 to 1917. In 1920 became Commissioner of the State Conservation Department. The Bazeleys maintained their primary residence in Uxbridge. On March 30, 1927, Margaret Bazeley transferred the property into both her and her husband’s names. The Bazeleys continued to live at 116 Commonwealth through the mid-1930s. They appear to have spent most of their time in Uxbridge, and their Boston house was shown as vacant in the 1934 and 1935 Boston City Directories. Margaret Bazeley died in February of 1936. 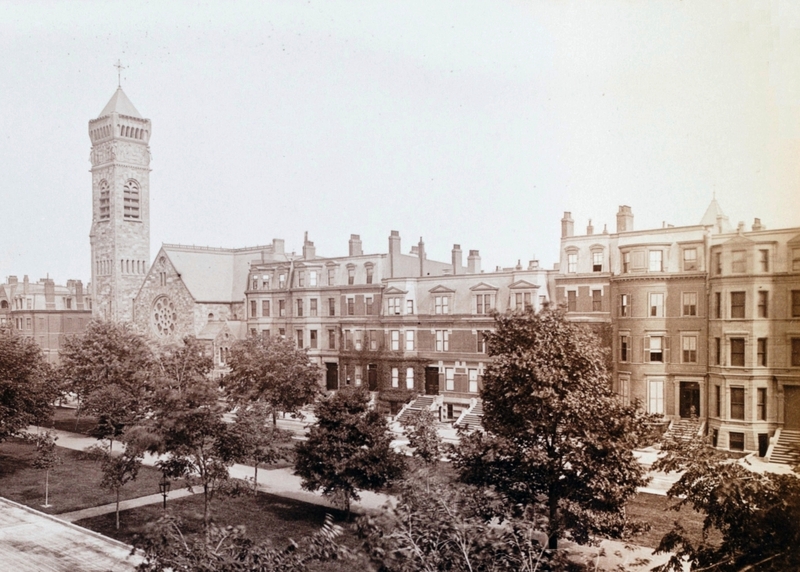 On June 1, 1937, 116 Commonwealth was acquired from William Bazeley by Emmanuel Church on Newbury. It became the church rectory, home of Rev. Phillips Endecott Osgood and his wife, Marion Curtis (Stone) Osgood. They previously had lived at 108 Marlborough. On September 11, 1944, 116 Commonwealth was acquired from Emmanuel Church by Mrs. Eva Mae (Buchanan) Chase, the former wife of George Woodman Chase. She lived at 116 Commonwealth with her unmarried children: Inda Chase, Duane Buchanan Chase, Madora Ruth Chase, Lauris Howard Chase, and Adeane Phyllis Chase. They previously had lived at 815 Beacon and before that, in 1938 and 1939, at 403 Beacon. In November of 1944, Eva Chase applied for (and subsequently received) permission to convert the house from a single-family dwelling into three apartments. By 1947, Eva Chase’s son-in-law and daughter, Harold Wilbur Blanchard and Laurene Lydia (Chase) Blanchard, had joined her at 116 Commonwealth, probably living in one of the new apartments. They previously had lived in Arlington. He was a chemist. In 1947, three of Eva Chase’s children married: Madora Chase married Richard Loveday, after which they lived at 116 Commonwealth; Duane Chase married Florence Maria Streeter, after which they moved to San Jose, California; and Lauris Chase married Barbara J. Clark, after which they moved elsewhere. Eva Chase and her unmarried daughters, Inda and Adeane, continued to live at 116 Commonwealth until about 1948, as did the Blanchards and the Lovedays. On June 15, 1948, 116 Commonwealth was purchased from Eva Chase by J. Franklin Knotts. It appears to have been operated as a lodging house. On April 24, 1950, 116 Commonwealth was purchased from J. Franklin Knotts by Miss Helen M. Canterbury and Miss Evelyn M. Duncanson. They previously had lived at 238 Hemenway and had operated The Duncanbury School of Arts at 205 Commonwealth. 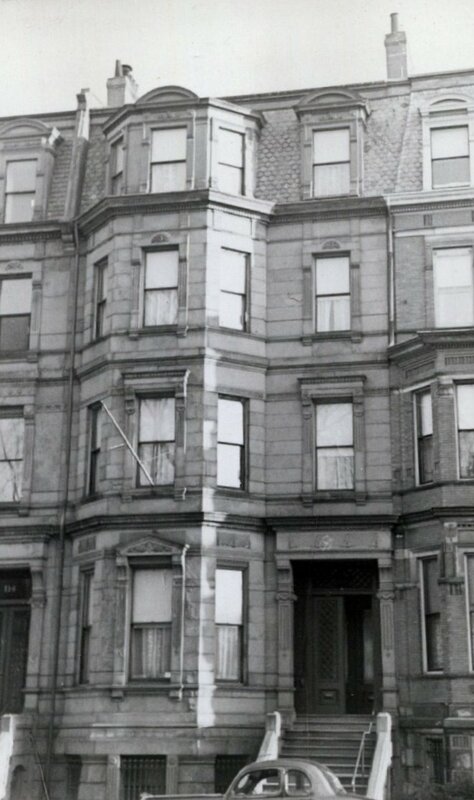 In July of 1950, Miss Canterbury and Miss Duncanson filed for (and subsequently received) permission to convert the property from three apartments into a lodging house. Soon thereafter, they began using a portion of the house as the Bahai Center. The neighbors objected, citing undue noise and disruption, and in December of 1950, Miss Canterbury and Miss Duncanson, along with the Spiritual Assembly of the Bahai, filed for permission to use the use of the first floor for religious meetings. In June of 1951, they filed a revised application seeking permission to used a portion of the house as an assembly hall and to provide private music lessons. The application was denied and their appeal was dismissed by the Board of Appeal. Helen Canterbury and Evelyn Duncanson continued to live at 116 Commonwealth until about 1955, operating a lodging house. On April 10, 1956, 116 Commonwealth was purchased from Miss Canterbury and Miss Duncanson by Chamberlayne School and Chamberlayne Junior College located at 128 Commonwealth. Chamberlayne Junior College operated 116 Commonwealth as a dormitory. In August of 1961, it filed for (and subsequently received) permission to convert the property from a lodging house to a dormitory, legalizing its current use. In the mid-1970s, Chamberlayne went bankrupt, and on June 16, 1975, it transferred 116 Commonwealth to Bernard P. Rome, trustee in bankruptcy. In May of 1977, Heritage Preservation, Inc., filed for (and subsequently received) permission to convert the property into five apartments. On October 17, 1977, 116 Commonwealth was purchased from Bernard P. Rome by the Phaeton Corporation (Paul S. Cohen, president and treasurer). On July 28, 1978, the Phaeton Corporation converted the property into five condominium units, the 116 Commonwealth Condominium.